This is the first in a two-part series on water reuse. Part I focuses on the rationale for recycling water and the laws that pertain to water reuse. Part II, which will appear in an upcoming issue, deals with treatment technologies used in water reuse. Water reuse comprises reclamation and treatment and often provides several benefits not derivative of other water sources. Moreover, reuse rapidly is losing elective status - in many situations representing the only economic, reliable source of supply. America is conferring ever-increasing attention to water recycling to stretch its water resources and expand its industry. The term "water recycling" would seem to define itself. However, it musters multiple meanings. A narrow one holds that it is the reuse of water with minimal, if any, treatment. More broadly, however, to recycle water implies use subsequent to its past use regardless of treatment. On the other hand, the subsequent application of "used" water (such as discharging to a river) is not necessarily water reuse. Reuse can be categorized as direct: treated wastewater is input directly to the supply; and indirect: treated wastewater enters the supply system separated in time or space, as by discharge to rivers or the ground for later removal. The term "water reuse," as for "recycling," has many interpretations, depending on the source of the definition. A Florida statute describes it as the deliberate - that is, intentional, direct - application of reclaimed water for a helpful use. A typical, broad interpretation holds that it is the reclamation and treatment of any water prior to its recycling - be it by municipality, industry, commercial establishment, private party or institution. A commonly accepted definition of the term "water reclamation" is the treatment of water after use - whether or not the treated water is discharged to surface waters or reused. Water recycling's purpose has been to create new, reliable water supplies while eliminating or reducing the burden of using methods to reduce the potential for pollution from the discharge of reclaimed waters. Most water recycling has been to meet non-potable, and often, tailored water demands. Thus, the so-called "fabs" (fabricators) of the semiconductor industry, to meet their needs for vast quantities of high-purity water, recycle their process water. Most recycling, however, involves agricultural purpose. Still, a number of projects use recycled water indirectly (almost exclusively until now) for potable purposes. Such projects include recharging groundwater aquifers and augmenting surface-water reservoirs. In addition, in groundwater-recharge projects, recycled water is being injected into aquifers to prevent salt-water intrusion. That has been in the case of the Water Factory 21 (Orange County, Calif.) since 1976. Many reasons underscore the recent growing interest in water recycling, including limited resources, regulatory obligations, water-quality concerns and economic gain. More than one reason may apply in a given situation, depending on the circumstances applicable to reclamation's considerations. Limited resources. Construction of new reservoirs can take 20 to 30 years to complete. But, recycling facilities can be built in a fraction of time and at a fraction of cost. In any event, adding reservoirs, even where practical, has limits. In addition, many of the most popular areas in the United States now attracting industry and populations are in the Southwest and Mountain West. These areas -- being arid or semi-arid -- largely depend on aquifers of limited capacity. This makes water conservation and end-of-pipe reuse critical strategies for ensuring long-term, dependable supplies. Water-quality concerns. Certain applications require special waters that are best obtained by recycling internally used water. Water for semiconductor fabrications (a use that requires large, ultra-pure quantities for rinsing and cleaning) and water for use in non-corrosive boiler makeup are among such applications. Regulatory concerns. No federal regulations impose water recycling (see sidebar, "Rules and Regulations") or set limits on it. However, legal restrictions on the discharge of used water often are sufficient reasons to recycle. Thus, stricter state and local wastewater disposal regulations and the rising costs of both central treatment systems and pollution cleanup are driving demand for reduced-effluent systems in the United States. Moreover, achieving zero discharge that meets federal criteria for a totally enclosed system can exempt a plant from satisfying certain onerous obligations. An example is Resource Conservation and Recovery Act (RCRA's) hazardous waste treatment permit requirements. Such zero-effluent discharge systems, which effectively eliminate wastewater discharge, are engineered on the basis of a three-part strategy - conserve, separate/divert and pretreat effluents at their sources and recycle. Economic gain. Wastewater disposal costs can be a key driver of recycling technologies. Also, some entities find advantage in recycling because it offers the simultaneous benefit of reclaiming valuable adjunctive product that would otherwise be lost. If separated and recovered, many such constituents (e.g., plating metals) have exceptional value in secondary markets. However, legal restrictions on the discharge of used water often are sufficient reason to recycle. The most rudimentary recycling per se is the consecutive use of water sans intermediate treatment. The earliest such use in the United States - dating to the beginning of the 19th century - involves the application of untreated wastewater to irrigate farmland. A contemporary application is the use of gray water (wastewater other than sewage, such as wash water drainage) as carriage for black water (liquid and solid human waste and the carriage water resulting from toilet use). Several design advances allow this last approach, including high-efficiency water-using appliances and fixtures. Gray water also can be used to irrigate thirsting plants (phreatophytes) in an aerobic planting bed. Here, the carbon in gray water is mineralized and the water content is evaporated and transpired, leaving no residual wastewater to be treated and disposed. One rung up. Much of the water reclaimed in areas of the United States gets piped directly to farms and industries from publicly owned treatment works (POTWs) that discharge wastewaters beneficiary to secondary treatment. A Bethlehem steel facility in Baltimore, for instance, uses such water in plant areas having cooling requirements. Some communities, such as Phoenix, Ariz., which is looking to enlarge its current demonstration scheme, feed POTW discharge to nurture wetlands -- typically, a series of rectangular plots filled with soil or gravel potted with plants that remove contaminants and lined to prevent waste from leaching into groundwater. Wetlands simultaneously improve the environment and quality of the water that is discharged to the river. Additional rungs. Many water uses require a quality that exceeds potable standards. Requirements can be satisfied by equipment as simple as a water softener or chemical-adding device or as complex as high-purity water systems (e.g., those serving computer-chip manufacturing or boiler feed) incorporating treatments that tackle deleterious-to-system ions in water. 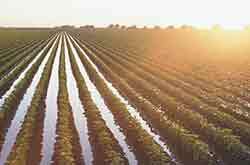 Also, common in the United States, for irrigation purposes, various forms of membrane processes are follow-up to conventional secondary treatment. No U.S. federal laws exist that directly regulate the recycling of water. However, the U.S. Environmental Protection Agency (EPA) regulates many aspects of wastewater treatment and drinking water quality, and a majority of states have established criteria or guidelines for the beneficial use of recycled water. Thus at the federal level, both the Clean Water Act and the Safe Drinking Water Act indirectly influence recycling, as follows: The Clean Water Act set the framework for regulating discharges of pollutants to U.S. waters. The law authorizes EPA to set effluent standards on an industry basis and continues the requirements to set water-quality standards for all contaminants in surface waters. Each sewage treatment plant must hold a permit listing the allowable levels of biological oxygen demand (BOD5), suspended solids, coliform bacteria and other pollutants. These discharge permits are called National Pollutant Discharge Elimination System (NPDES) permits. The Safe Drinking Water Act (SDWA) governs allowable chemical and biological contaminants in drinking water. As such, the SDWA manages the quality of potable-water replenishment. Also, in 1992, EPA issued the technical document, "Guidelines for Water Reuse," which currently is being updated for release in 2002. (Also see "Quality Criteria for Water Reuse," National Research Council Report, 1982; and "Issues in Potable Reuse," NRC Report, 1998.) Although not prescriptive, EPA 430109-91-022 contains information, such as a summary of state requirements and recommended guidelines for many uses of recycled water. In addition, many U.S. states have developed or are developing regulations for water reuse. These mainly assimilate existing discharge water quality standards and technology requirements, such as type of process, multiple barriers and retention time. State and federal regulatory oversight has provided a successful framework to ensure the safety of the many water-recycling projects developed in the United States. Constructed wetlands have an established role in water recycling. They mimic nature by mechanically filtering, chemically transforming and biologically consuming potential pollutants in the wastewater stream. As implemented for the Triangle School Wastewater Treatment System in Chatham County, N.C., they consist of a series of plots filled with crushed brick, sand and gravel. Plastic sheet lines the plots -- populated by native wetland plants to assist wastewater treatment -- to prevent waste from leaching into the groundwater. Two types of constructed wetlands -- low marsh (subsurface flow) and high marsh (vertical flow)--are shown in the figures. The latter combines sand filter and subsurface wetland, which mimics a set of sand dunes surrounding a marsh. Water flows vertically through the three sand filters, then horizontally below the surface of the wetland. The sand filter remains aerobic by controlled six- to eight-hour wastewater-dosing intervals. As water flows vertically through sand and plant root s, potential pollutants are filtered, transformed or stored. The low marsh design floods and drains in a manner similar to that of a tidal marsh. Both the depth and time of flooding can be controlled. William D. Ruckelshaus. McGraw-Hill Recycling Handbook, 2nd Ed. Herbert F. Lund, editor. New York. 1998. Chin, K.K. and Kumarasivam, K. Industrial Water Technology: Treatment, Reuse & Recycling. Elsevier Publications, Amsterdam, New York, London. May 1986. This article originally appeared in the July 2001 issue of Environmental Protection, Vol. 12, No. 7, p. 29.